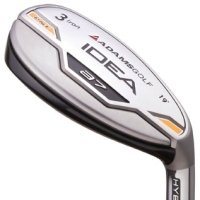 Adams took the best attributes of several generations of the popular Idea Pro Hybrids to create the Idea a7 Hybrid—a blend of high performance, forgiveness and increased carry distance. Sole camber design improvements increases performance from all lies. Rear weighted to increase spin and launch the ball mid-to-high. High performance, premium UST Proforce AXIVCore Black graphite shaft.